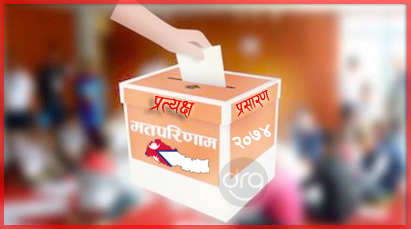 The first phase Local Level Election Nepal 2074 of 3 provinces [3, 4 & 6] is over now. Nepal Election Commision has started publishing result of Nepal's 1st Phase Local Level Election 2074. Nepal Chunav result live is in my blog. Nepal election result is online and is being counted. The votes would be counted at the headquarters of concerned local body after transporting the ballot boxes from voting stations. You can visit my page to know the latest count of Nepal Election Result. I'm trying to provide the live updates of Nepal Election Result 2017. You can see the live vote counting of Nepal local elections results 2017 over here. So for this, you need to follow the link of Election Commission Nepal [The Official Website of Nirbachan Aayog]. Or you may keep surfing my blog regularly to see the LIVE Latest Updates Of Nepal Local Level Elections Results 2017. Please keep in mind that the "LIVE Nepal Election Result" data you can see on this post is hosted by Election Commission Nepal. Updated [1 Asoj, 2074/17 September, 2017]: Here is the Live Vote count updates and results of province 2 [Local Election Nepal 2074]. Updated [21 Mangsir, 2074/7 December, 2017]: Here is the Live Vote count updates and results of Federal Parliament and Provincial Assembly Local Election Nepal 2074/2017. If you see any error from the above result please wait for few seconds and try again. Due to large number of request, the server may respond very slow. Note: Kindly be noted that I am actually not the official publisher of this Live Election Result, all the data you can see on this blog page is taken from official web page of Election Commission Nepal, 24liveblog, OnlineKhabar, etc. Your comments, suggestions are always welcome. Thank you. 4 Responses to "Nepal Election Result | Local Election Nepal 2074 | "LIVE" Vote Count Updates"
Thank You for the nice words Santosh Bhai. Your valuable comments means a lot for me. It's my first try on blogging field. Stay Happy. I appreciate your hard work admin. Really helpful LIVE Updates. Keep blogging. Thank you. Thank You Sita Ram ji.